Chapter headings and selected papers: Preface. Bulk Growth and Hydride Vapor Phase Expitaxy. High pressure fabrication and processing of GaN:Mg (T. Suski et al.). Metalorganic Vapor Phase Eqitaxy. Sub-bandgap optical absorption of MOVPE-GaN grown under controlled nucleation (P. de Mierry et al.). Molecular Beam Epitaxy. Influence of buffer layers on the structural properties of molecular beam epitaxy grown GaN layers (V. Kirchner et al.). Highly textured hexagonal AIN films deposited at low temperature by reactive cathodic sputerring (F. Brunet et al.). Lateral Growth. Selective area growth and epitaxial lateral overgrowth of GaN by metalorganic vapor phase epitaxy and hydride vapor phase epitaxy (K. Hiramatsu et al.). Luminescence, Excitons and Optical Properties. Luminescence in III-nitrides (B. Monemar) . Structural Properties. Investigation of the atomic structure of the pure edge and a + c threading dislocations in gan layers grown by MBE (P. Ruterana et al.). X-ray analysis of the texture of heteroepitaxial gallium nitride films (N. Herres et al.). Characterization. Raman spectroscopy of disorder effects in AlxGa1_xN solid solutions (V.Y. Davydov et al.). First Principles Calculations. Lattice dynamics of boron nitride (H.W. Leite Alves et al.). Properties of InGaN. Influence of strain and buffer layer type on In incorporation during GaInN MOVPE (F. Scholz et al.). Quantum Wells and Nanostructures. Optical properties of InGaN quantum wells (S.F. Chichibu et al.). Self organization of nitride quantum dots by molecular beam epitaxy (B. Daudin) Processing and Contacts. Smooth GaN surfaces by photoinduced electro-chemical etching (T. Rotter et al.). Lasers and LED's. Theoretical optical gain in InGaN quantum wells (T. Uenoyama et al.). Electronic Devices and Photodetectors. Microwave electronics device applications of AIGaN/GaN heterostructures (Q. Chen et al.). 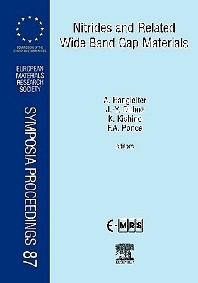 The Symposium on 'Nitrides and related wide band gap materials' at the 1998 Spring Meeting of the European Materials Research Society (E-MRS) in Strasbourg, France, was the third Symposium of its kind at an E-MRS meeting. Beginning in 1996, these Symposia enjoyed a steadily increasing popularity among European and international nitride researchers. For about 5 years now, semiconducting group-III nitrides have attracted an enormous level of research activity all over the world. Essentially this was triggered by the breakthroughs achieved by Shuji Nakamura and his group in Japan, who succeeded in making highly efficient blue, green and yellow light emitting diodes as well as violet laser diodes based on A1GaInN. Since then, intensive research related to material growth, device development, as well as to the fundamental properties of these materials is being carried out. The outstanding contribution of Shuji Nakamura to this field was underlined by his plenary lecture during this E-MRS meeting. He presented his most recent progress towards amber LED's and long-lived violet laser diodes. For European and international nitride researchers.